Well guys, My journey has finally come full circle. The dream I started 4 months ago has finally been completed. 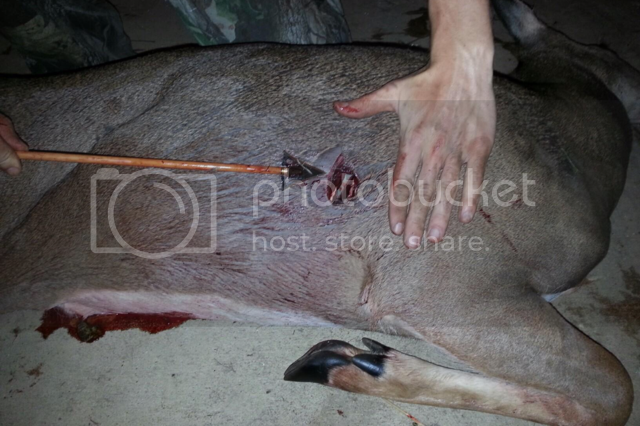 To harvest a deer with traditional archery. There are many people who have helped me complete this journey, and start the addiction that will continue throughout my lifetime. First and for most I would like to thank KentuckyTJ for going out of his way to help find me a mentor to teach me. KentuckyTJ got me in touch with Rob and Charlie( oldskool and buckeye_hunter). Rob and Charlie taught me everything, simple as that. From form to aiming, these guys did it all. Plus they are 2 new life long friends anyone would be happy to have. I cant thank them enough. Now on to the story. It was 5:30 by the time I had gotten into the stand, my last minute practice session and smoking of my clothes took longer than expected. 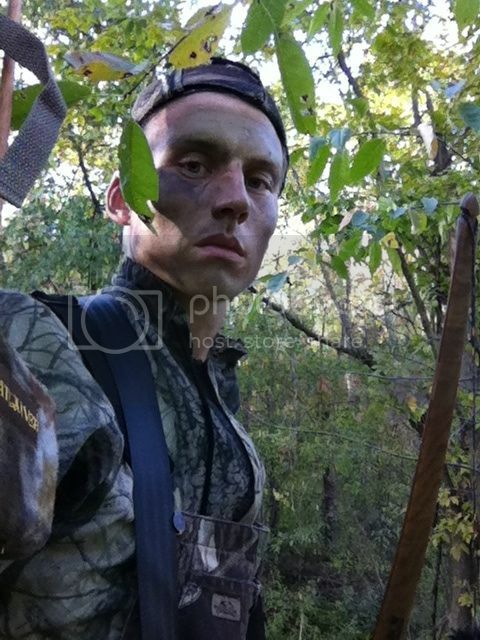 I was 16 feet up a walnut tree with a creek crossing point behind me. Charlie taught me to face towards the tree, using it as cover to shoot around. I had a good SW wind that blew directly into my face. It looked as If it was going to be a good evening. At 6:45 I looked over above the creek and saw 3 deer 60 yards away heading towards the creek. They splashed and drank in the water for over 15 minutes while I sat and enjoyed watching them. Than 3 more deer arrived. They meandered around for awhile until the lead doe started walking down the creek, right towards me. They came closer and closer as I stood and watched motionless. Than the Lead doe turned and headed up the trail right past my stand. The doe walked right past my tree I was hiding behind. As she walked up the trail slightly quartering a mear 4 yards away, I drew and released. The arrow struck right behind her shoulder and she took off. The arrow was in her but I was concerned I didn't get enough penetration. It was than I realized I had short drawn my bow as target panic had over taken me. The doe was gone in a flash and I looked around to see that the other deer were still standing there. 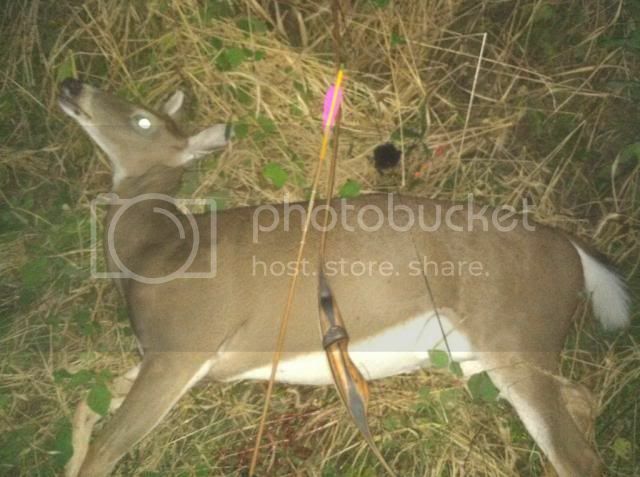 My bow was so quiet that It hadn't spooked the doe that was standing directly behind the one I had shot. I quickly put another arrow in but decided against taking a shot at another deer, as I had enough work on my hands already. As I stood collecting my thought and trying to grasp what had happened I realized the deer around me weren't going anywhere. they continued to walk around and eat. I didn't want to spook them so I just stood as still as I could. They finally walked out of sight and I started trying to pack up and get out of the stand. than I heard a deer blow. I looked back to see a deer 60 yards downwind, staring right at me. I froze and within seconds she forgot I was there. My wind was blowing right at them but they continued unalarmed. A small buck came and started chasing them and they finally left. As I was getting down I looked over across the creek to see a deer staring at something in the grass. I prayed it was my deer laying there that the other one was staring at. As darkness overset I packed up and climbed down. The shot had happened so fast I could barely remember where the deer had ran off at. I found no blood at the shot site. As I walked up a trail I soon found spraying blood all over the right side of the trail, which lead into a thorn patch. it was getting dark and I wanted help tracking her. I called a friend and just as I was about to go meet him I decided to go see what that deer had been staring at. I walked over to find my beautiful deer laying there. She had made a mad dash though the thorn, back across the creek, than fell in a stand of young walnuts. I was overjoyed. My friend arrived and we quickly got her gutted and skinned out. It was a wonderful evening that I got to spend heavily in Gods presence. There is no doubt in my mind the big man above was by my side every step of the way. He proves us with so much on this beautiful earth! Thanks again Trad Gang for helping me along the way to start the passion that burns deep in my soul. Even though I had short drawn the arrow still did the job. 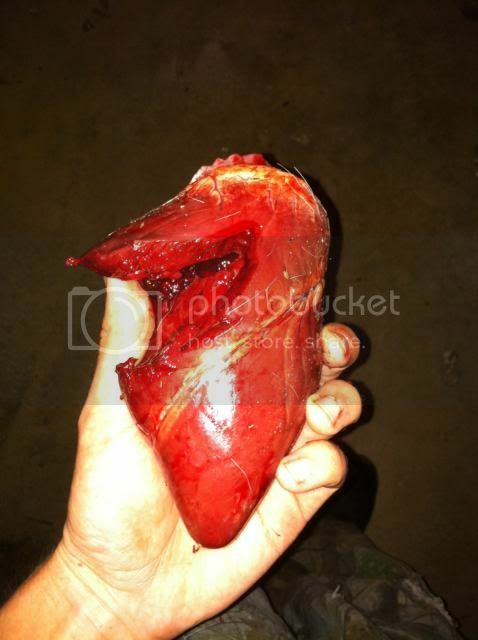 The 165 grain land shark cut a huge path and went right through her heart, stopping on the opposite shoulder. 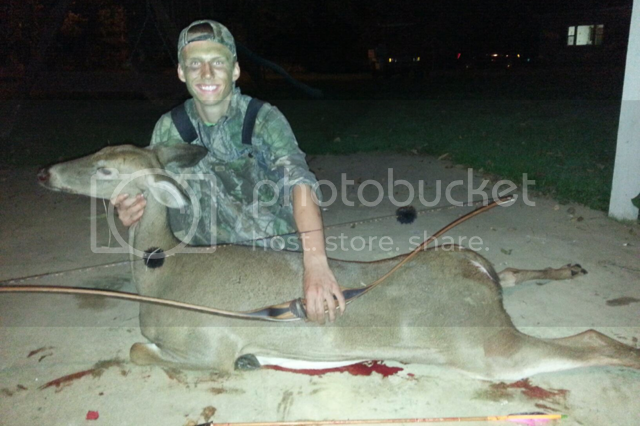 what A great hunt with my caribow wolverine and my first trad deer! Great job and great story. Thanks for sharing it with the rest of us addicts! Welcome to the lifelong obsession we trad bowhunters enjoy so much. "Currently shooting whatever strikes my fancy"
Big ol Gal. The first is always one of the best! Nice shooting Taylor!!! Congrats on your first of many!